I read this article and found it very interesting, thought it might be something for you. The article is called Read a Classic – The Pritikin Program and is located at http://www.gardendish.com/read-classic-pritikin-program/. Are you a lifelong learner? 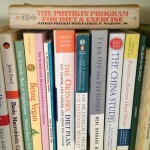 If so, you probably have your own personal library of books and videos on plant-based nutrition, health, and lifestyle. What are your “top-shelf”, must-read classics? Maybe “The McDougall Plan”, by John and Mary McDougall, or “The China Study”, by T. Colin Campbell come to mind. A recent addition to my top-shelf collection of classics is “The Pritikin Program for Diet and Exercise”, by Nathan Pritikin with Patrick M. McGrady, Jr., first published in 1979. Why read an old, musty, dusty paperback book with yellowed pages and a missing cover? In the case of “The Pritikin Program”, the author was writing one of his first books. I’ve found that the early writings of pioneers in a field show a clarity of thought that is often missing from later works. For instance, in describing his program, Pritikin writes, “The Pritikin Diet is low in fats, cholesterol, protein, and highly-refined carbohydrates, such as sugars. It is high in starches, as part of complex, mostly unrefined carbohydrates, and is basically ‘food as grown’, eaten raw or cooked”. In two sentences, he clearly outlines the fundamentals of the diet – brilliant! Do you also uncover other kinds of value from the classics? I’m often excited to learn that our predecessors already knew (or at least surmised) much of what seems unfamiliar or hazy to many of us today. Pritikin wrote in 1979 that “fat and cholesterol cause cardiovascular disease and diabetes”. Shockingly simple and straightforward. Or, consider this quote from the book, “Any added oil or fat is unnecessary and potentially damaging”. Maybe we aren’t used to hearing such direct language these days, but upon reflection, I think I do harm myself when I make a poor decision and eat fatty, oily food – even if it’s vegan. Finally, I also find it stunning to draw parallels between the current day and the era when a classic book was written. For instance, after describing the high-carbohydrate component of the diet, Pritikin writes, “Surprised? In all probability you thought carbohydrates were a big no-no. After all, most of the popular diets of the last few years have pilloried carbohydrates – and praised protein and fat”. Sounds like it could have been written yesterday, not 30+ years ago. For a classic to deserve the moniker, it has to motivate you, right? 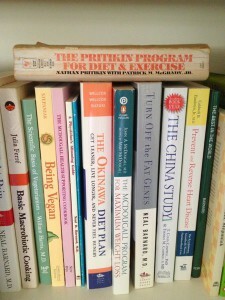 Pritikin’s book instilled in me a desire to change, specifically to stop snacking on boxed cereals (like Raisin Bran and Honey Nut Cheerios). While vegan, these cereals are highly processed with lots of added sugar. I could use a snack right now, so I think I’ll grab a peach – and another classic from my top shelf.